The alliance of John Holland, KBR and MTM who oversaw the removal of Buckley Street in Essendon, Skye/Overton Road in Seaford and Camp Road in Campfield's level crossing removals has been awarded the contract to remove Reservoir's complex level crossing. Track will be elevated above the existing railway grade, as foreshadowed back in September, and a new station will be built as part of the project. The Level Crossing Removal Authority (LXRA) put the price tag for the large project at $232 million and updated designs will be released in early 2019. Early and geotechnical work has been underway for some time and major construction work will in 2019 with a completion date set for 2020. The new premium station will include above ground platforms with access via lifts and stairs. 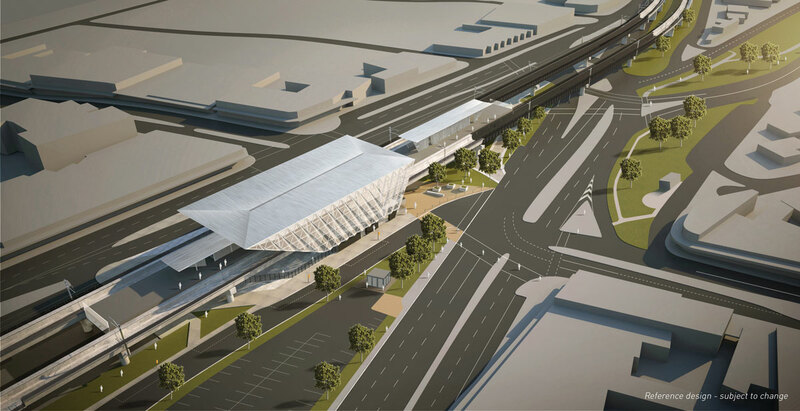 In response to community feedback, the station precinct will better connect the east and west of the Reservoir station precinct – an added benefit of a rail over design. The Mernda line was also a beneficiary of the Andrews Government re-election policy that expanded the initial list of 50 level crossings to 75. Oakover Road, Murray Street and Cramer Street in Preston, in addition to the already-announced Bell Street, when removed will make central Preston level crossing free. A couple of kilometres to the west, the same thing will happen in Coburg. Bell Street in Coburg was on the initial list of 50 level crossings to be removed and Maynard Street and Munro Street will go, presumably, at the same time as Bell Street gets underway. For more information on the list of 75 level crossings to be removed, see the LXRA's website.